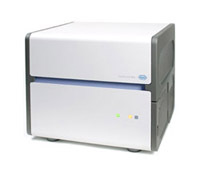 The LightCycler 480 Real-Time PCR System is a fully integrated multiwell-plate based real-time PCR platform for highly accurate qualitative and quantitative detection of nucleic acids. The instrument handles both 96 and 384w plates, rapidly switching between blocks (protocol below). The LC480 can measure Ct and melt curves and can do protein melt curves as well. The instrument handles SYBR and Taqman probes. ROC standards are not required on the instrument, though it can detect them. There is a charge per plate to cover the cost of the service contract. Please Note: There are three LightCycler systems (Thing 1, Thing 2, and Thing 3) that have a sign up maximum of four hours per day during business hours (10AM to 5PM), all time slots are available the night before even if it exceeds the maximum. This page was last edited on 20 October 2018, at 20:37.